Two-thirds of the way through the longest open-ocean leg of a circumnavigation of the world, Notre Dame alumna Dava Newman suddenly lost control of her 47-foot sailboat. She and her husband discovered that the steering system failed because all the hydraulic fluid had leaked from a crack in a copper hose. It was about 1 a.m. and both were exhausted. They were stranded in the middle of the Pacific Ocean 1,000 nautical miles from the nearest land. Dava Newman is the deupty administrator of NASA and a 1986 graduate from the University of Notre Dame. Newman had bought four liters of extra virgin olive oil in Panama. As an engineer, she knew the olive oil had the same viscosity as hydraulic fluid. So they filled the system with olive oil, clamped the hose, rigged up a sort of IV system to capture and recycle the still-leaking oil, and sailed for more than a week to reach the Marquesas Islands. That lesson in surviving a harsh environment has served Newman well in her leadership of NASA and its “horizon goal” to put people on Mars in the 2030s. 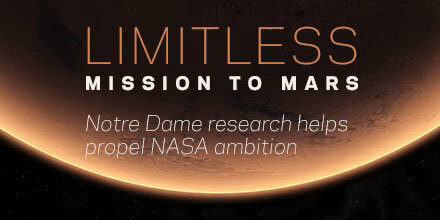 It also helped fuel her ambition to push further into space, an endeavor supported by academic research that includes several NASA-funded projects at Notre Dame aiming to expand the limits of human exploration. These projects range from scientists developing new ways to find the nearest earth-like planets to engineers studying the origins of the moon or the conversion of solar energy into electricity. Originally published by Brendan O’Shaughnessy at research.nd.edu on November 03, 2016.